If you ever find yourself in the Ringwood area of New Jersey officials recommend that you consume no more than two squirrels per week and even less for children and pregnant women. This is because they have found squirrels in the area that have been tainted with lead, most likely from waste dumped in the 1960s and '70s by a now closed Ford plant in Mahwah. Because of this I have decided to completely cut squirrel out of my diet. 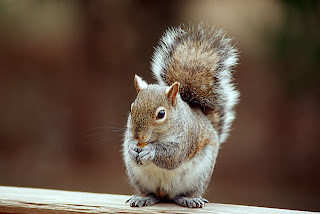 I am now a non-squirrelitarian and highly recommend that you become one too. All joking aside, this town of Ringwood, New Jersey appears to be a mess. Not only are they worried about lead levels in the squirrels, they are worried about it in other wildlife that people hunt for sustenance such as deer. On top of all that they are having problems with sinkholes opening up from old mines scattered throughout the area. Some as large as 15 feet deep and 20 feet wide.